1, 2. 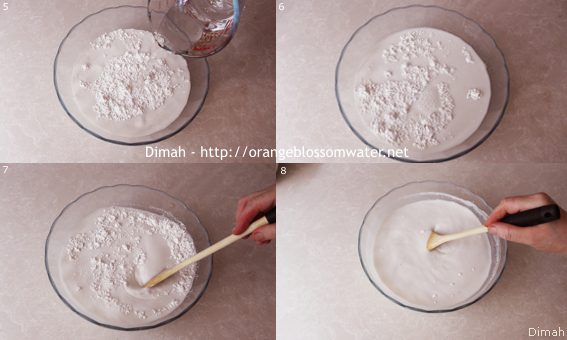 Put 100 g slaked lime powder (calcium hydroxide) in a large ceramic or glass bowl. 3, 4, 5, 6. Add 1500 ml warm water to it. When water is added, it heats up and bubbles like it’s boiling, make it seems alive. 7,8. Immediately stir with a wooden spoon. 9, 10, 11, 12. Set aside for 1 hour, this will allow to separate the precipitate and clean water. 13, 14, 15, 16. These are baby eggplants, and this is the type of eggplants used for making jam (try to find the same kind in the picture), approximately 1 1/2 – 2 inches long (4 – 5 cm). 17, 18, 19, 20. 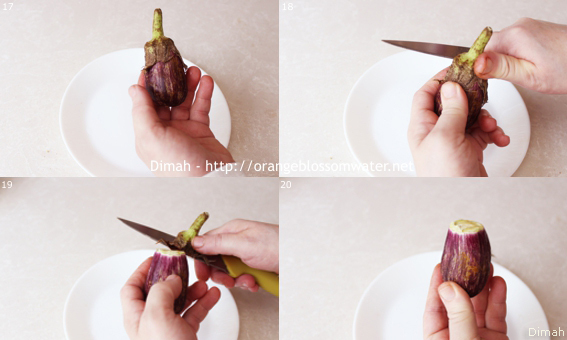 Rinse eggplants with water. Cut off the cap and the stem. 21 to 32. Hollow eggplants from one end with squash / eggplant corer leaving about 0.2 inch (0.5 cm) thick shell all around, and be careful to leave one end of eggplant intact, if you don’t have squash / eggplant corer try to use apple corer. 33, 34. Put hollowed eggplants in a large bowl. 35. Bring the bowl of slaked lime and water. 36, 37, 38, 39, 40. 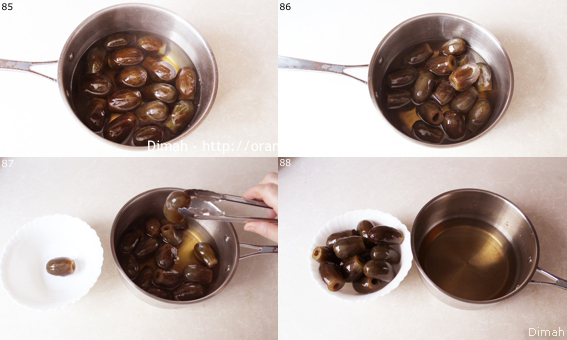 Use a ladle and add the clear water to the eggplants. Discard the white precipitate and don’t add it to the eggplants. 41, 42, 43. Put ceramic or glass plate over the eggplants to immerse them, and set aside for 24 hours. 44. After 24 hours, remove the plate. 45, 46, 47, 48. 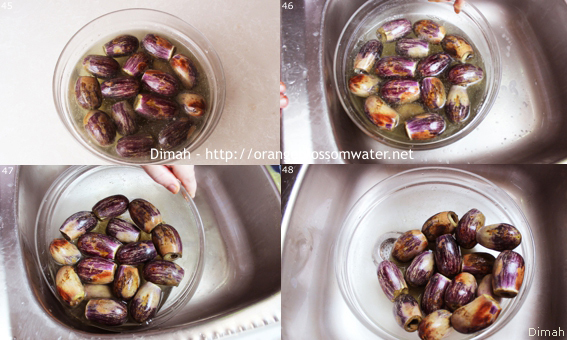 Drain water from eggplants. 49, 50, 51, 52. 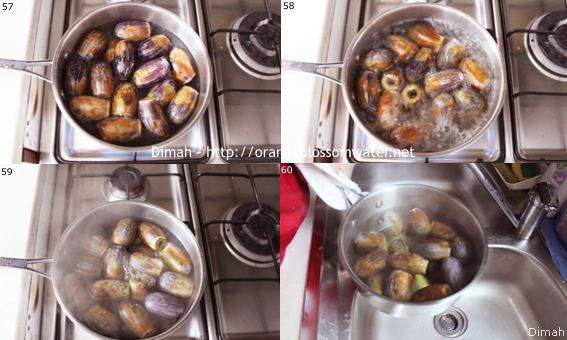 Wash eggplants and rinse in several changes with water. 53 to 58. Put eggplants in a saucepan filled with boiling water, boil for 3 minutes. 59, 60, 61, 62. 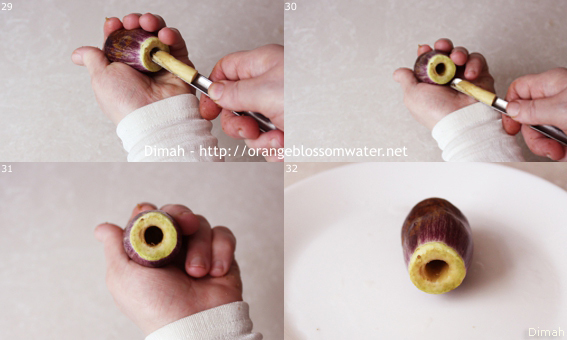 Drain hot water from eggplants. 63. 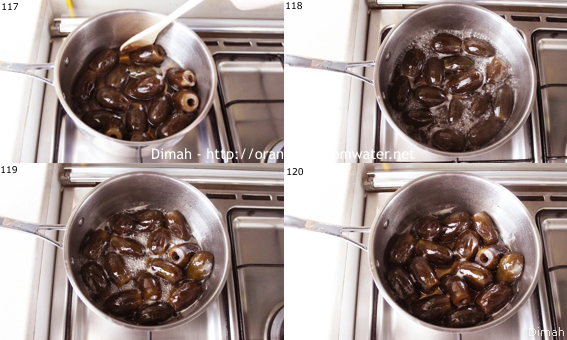 Soak eggplants in water for 30 minutes. 64. 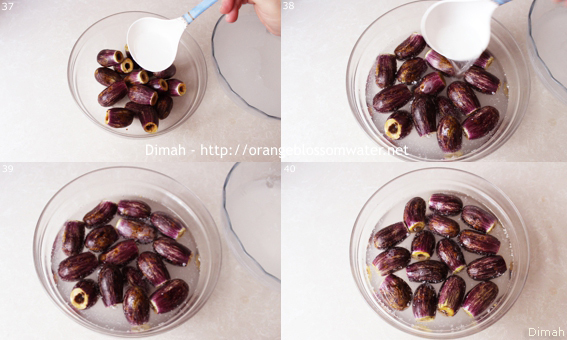 Drain water from eggplants. 65, 66. 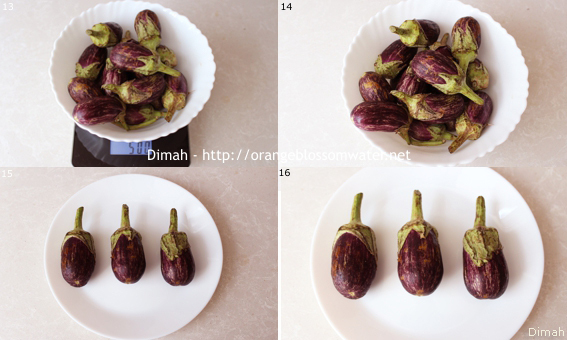 Wash and rinse eggplants in several changes with water. 67. 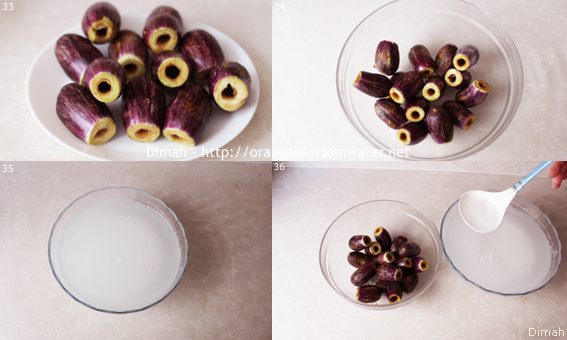 Soak eggplants in water. 68. 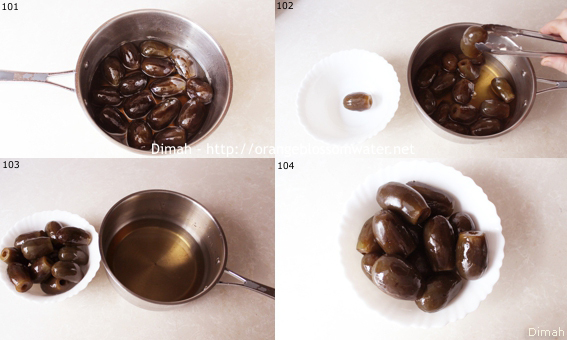 Put ceramic or glass plate over the eggplants to immerse them, and set aside for 1 hour, then drain water from eggplants and again soak in water and put a ceramic or glass plate over to immerse them and set aside for 1 hour, then drain water from eggplants and repeat the process. Repeat the above steps at least 10 times (picture 65 to picture 68). 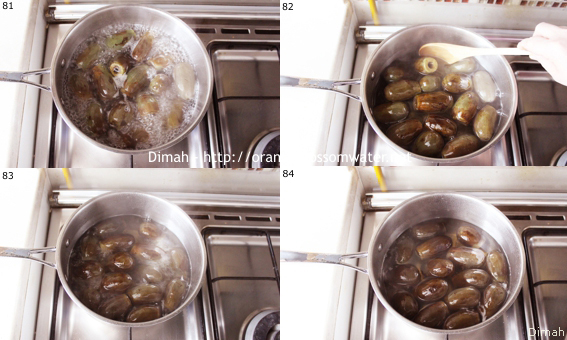 After 10 times, keep eggplants in water with a plate over them and set aside till next day. These steps are done to get rid of any traces of slaked lime. 69, 70. Next day. put 500 g sugar in a saucepan. 71, 72. Add 500 ml water to sugar. 73, 74, 75, 76. 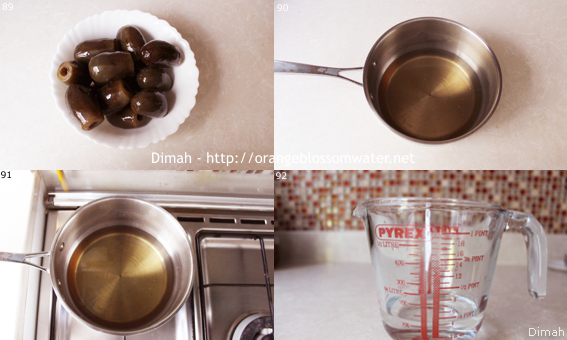 Dissolve sugar in water over high heat, and let it boil for 5 minutes. 77, 78, 79, 80. Add eggplants to sugar syrup. The temperature of the syrup will go down when you add eggplants, therefore keep over high heat and bring to boil and let it boil for 5 minutes with gentle stirring using a wooden spoon. 81, 82, 83, 84. Reduce heat and simmer over low heat for 30 minutes, stirring occasionally. 85, 86. Turn off heat and keep eggplants in sugar syrup for 24 hours, stirring occasionally. 87, 88. 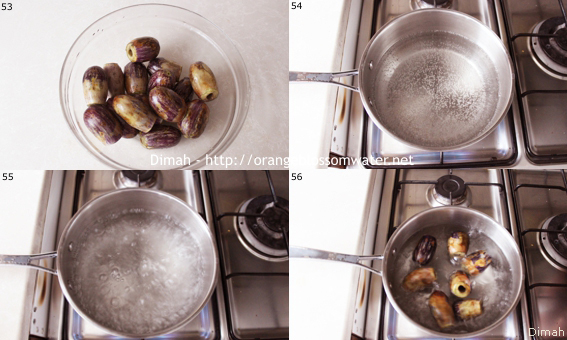 After 24 hours, remove eggplants from sugar syrup. 90, 91, 92, 93. 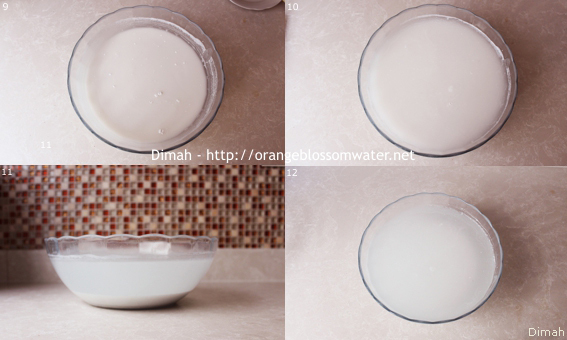 Add 125 ml water to sugar syrup. 94. Bring sugar syrup to boil. 95, 96. Add eggplants to sugar syrup. 97, 98. Reduce heat and simmer over low heat for 30 minutes, stirring occasionally. 99, 100. Turn off heat and keep eggplants in sugar syrup for 24 hours, stirring occasionally. 101, 102, 103, 104. 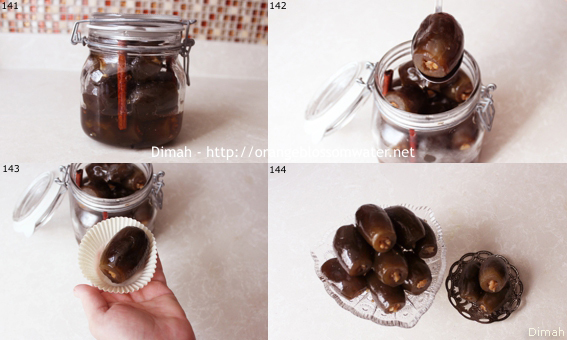 After 24 hours, remove eggplants from sugar syrup. 105, 106, 107, 108. 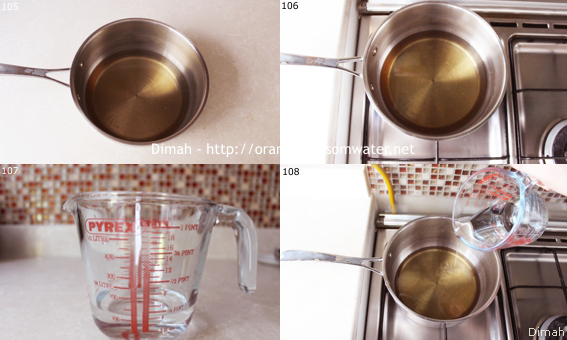 Add 125 ml water to sugar syrup. 109, 110, 111. 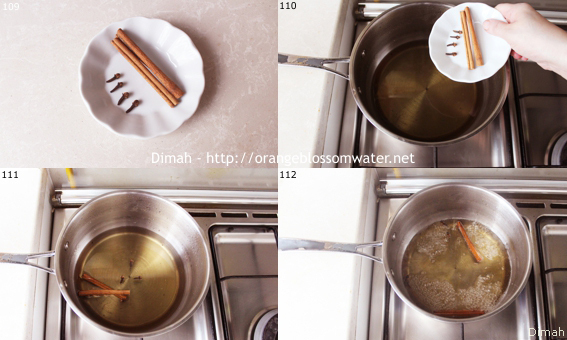 Add 2 cinnamon sticks and 4 clove buds to sugar syrup. 112. Bring sugar syrup to boil. 113, 114, 115. Add eggplants to sugar syrup. 116. Add 1/8 teaspoon lemon salt (citric acid). 117, 118, 119, 120. Reduce heat and simmer over low heat for 30 minutes, stirring occasionally. 121. Turn off heat. Keep eggplants in sugar syrup and allow to cool to room temperature. 122. 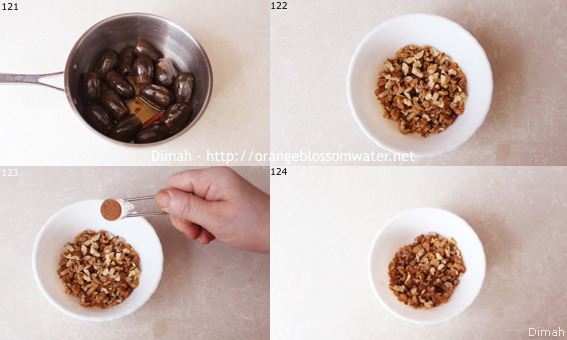 Measure 50 g chopped walnuts in a bowl. 123, 124. Add 1/8 teaspoon ground cinnamon to chopped walnuts and mix. 125 to 131. Stuff each eggplant with walnuts mixture. 132. 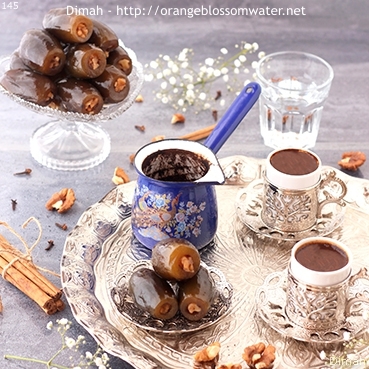 Do not discard the sugar syrup. 133 to 138. 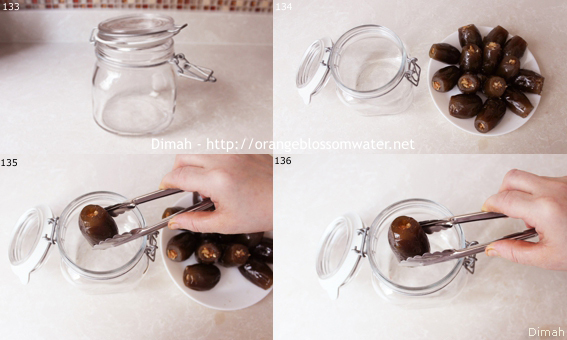 Transfer stuffed eggplant jam into a jar. 1390, 140. Pour syrup with the 2 cinnamon sticks and the 4 clove buds over eggplant jam. 141. It is fine if syrup did not cover all the eggplants. Seal and store in the refrigerator. 142. Bring eggplant jam to room temperature before serving. 143, 144. Serve in paper liners if you like, or just in a plate without papers. 145. 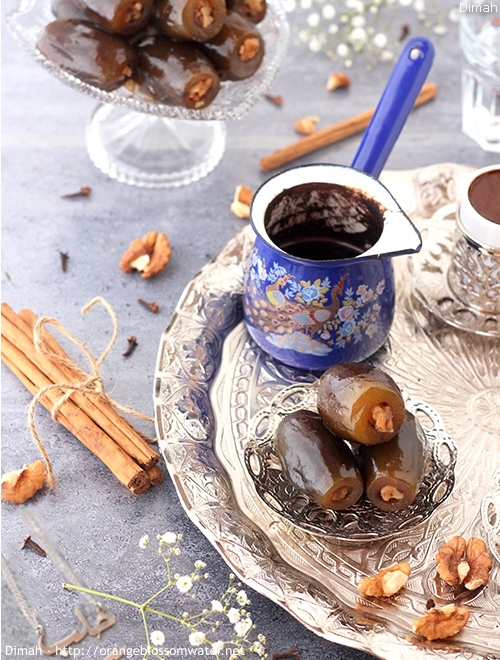 Serve Mrabba Al-Bathenjan Al-Halabi with Turkish coffee. 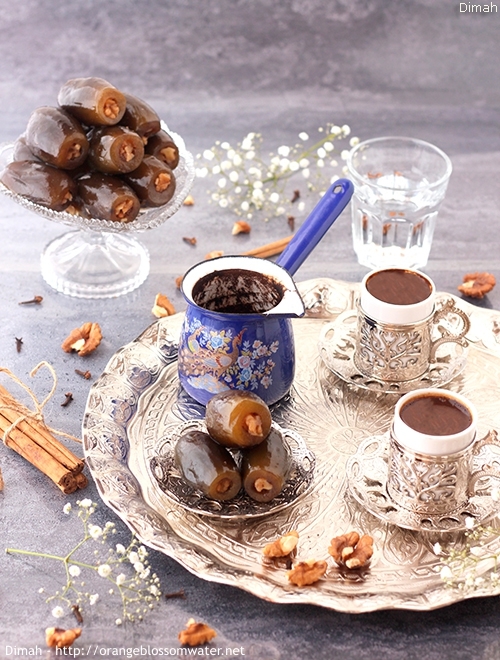 Turkish coffee Put 100 g (calcium hydroxide) in a large ceramic or glass bowl. Add 1500 ml warm water to it. When water is added, it heats up and bubbles like it’s boiling, make it seems alive. Immediately stir with a wooden spoon. Set aside for 1 hour, this will allow to separate the precipitate and clean water. These are baby eggplants, and this is the type of eggplants used for making jam (try to find the same kind in the picture), approximately 1 1/2 – 2 inches long (4 – 5 cm). 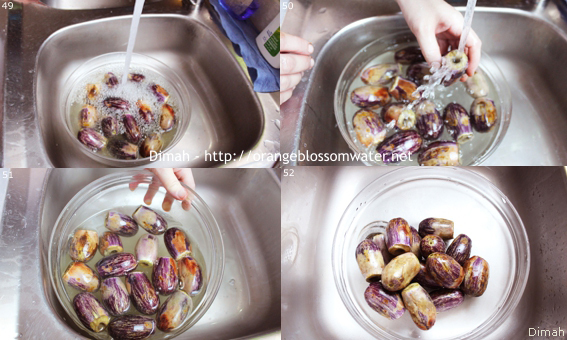 Rinse eggplants with water. Cut off the cap and the stem. Hollow eggplants from one end with squash / eggplant corer leaving about 0.2 inch (0.5 cm) thick shell all around, and be careful to leave one end of eggplant intact, if you don’t have squash / eggplant corer try to use apple corer. Put hollowed eggplants in a large bowl. Bring the bowl of slaked lime and water. 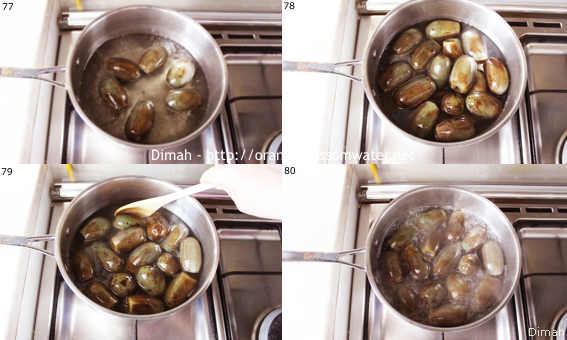 Use a ladle and add the clear water to the eggplants. Discard the white precipitate and don’t add it to the eggplants. Put ceramic or glass plate over the eggplants to immerse them, and set aside for 24 hours. After 24 hours, remove the plate. 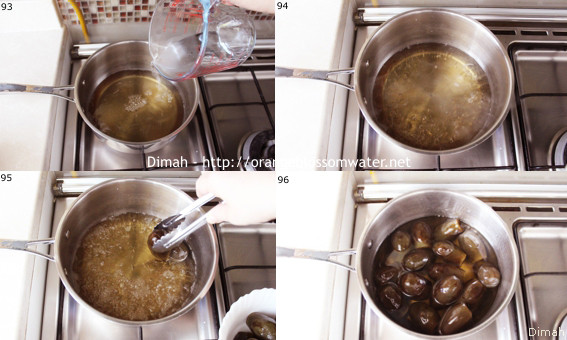 Wash eggplants and rinse in several changes with water. Put eggplants in a saucepan filled with boiling water, boil for 3 minutes. 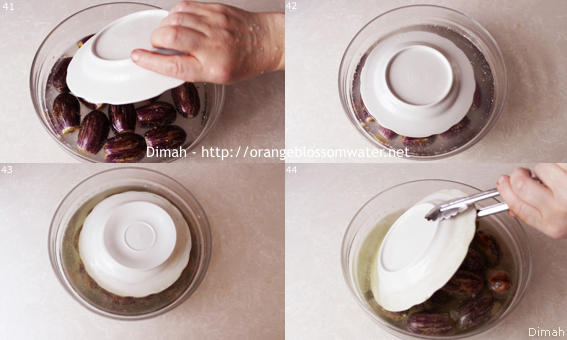 Drain hot water from eggplants. 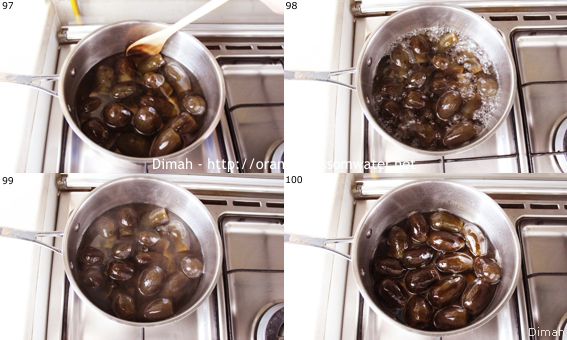 Soak eggplants in water for 30 minutes. Wash and rinse eggplants in several changes with water. 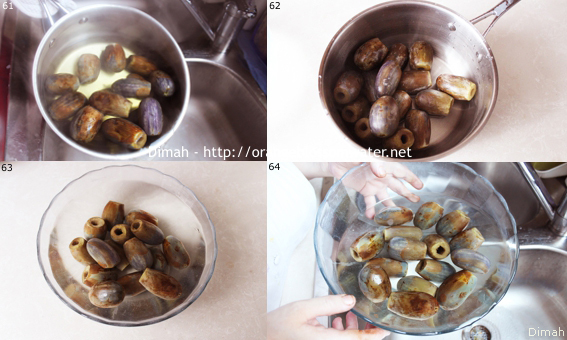 Put ceramic or glass plate over the eggplants to immerse them, and set aside for 1 hour, then drain water from eggplants and again soak in water and put a ceramic or glass plate over to immerse them and set aside for 1 hour, then drain water from eggplants and repeat the process. Repeat the above steps at least 10 times (picture 65 to picture 68). 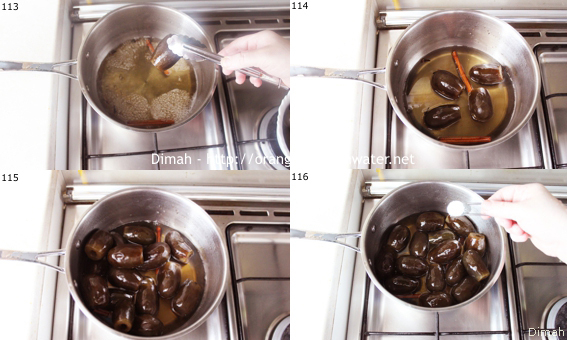 After 10 times, keep eggplants in water with a plate over them and set aside till next day. These steps are done to get rid of any traces of slaked lime. Next day, put 500 g sugar in a saucepan. 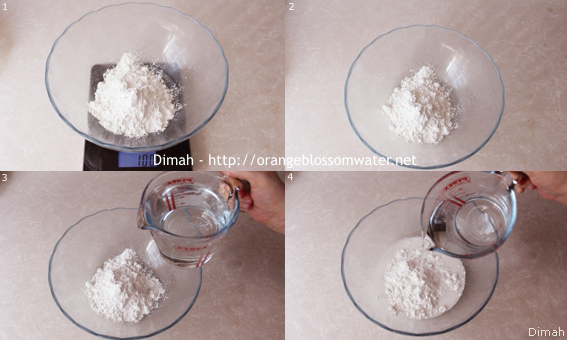 Add 500 ml water to sugar. 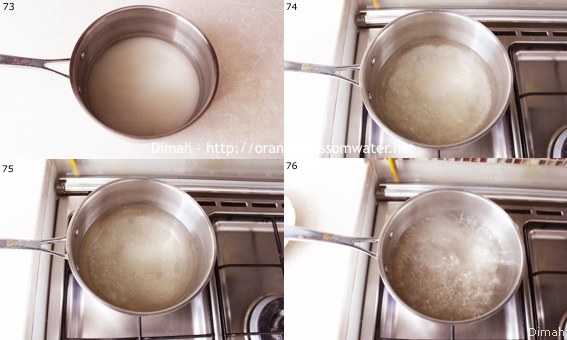 Dissolve sugar in water over high heat, and let it boil for 5 minutes. Add eggplants to sugar syrup. 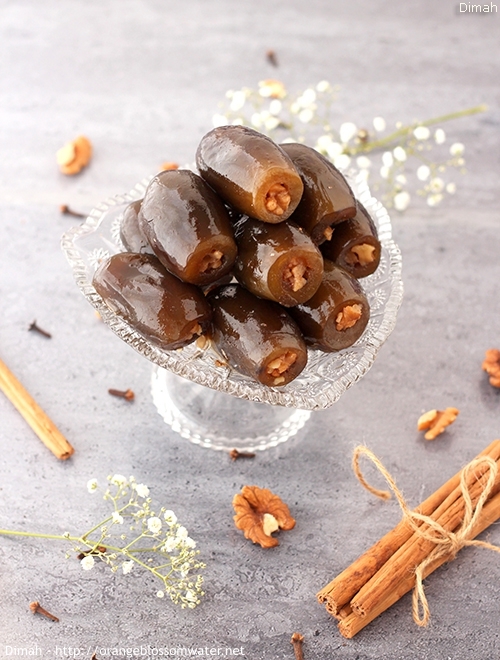 The temperature of the syrup will go down when you add eggplants, therefore keep over high heat and bring to boil and let it boil for 5 minutes with gentle stirring using a wooden spoon. Reduce heat and simmer over low heat for 30 minutes, stirring occasionally. Turn off heat and keep eggplants in sugar syrup for 24 hours, stirring occasionally. 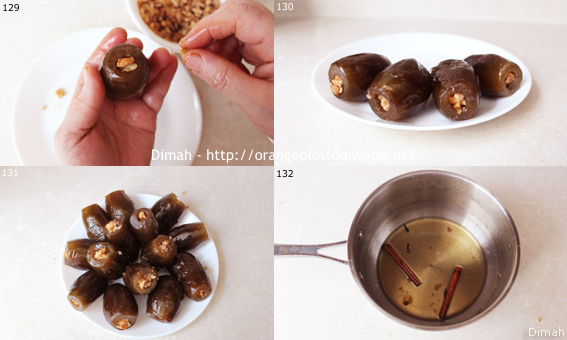 After 24 hours, remove eggplants from sugar syrup. 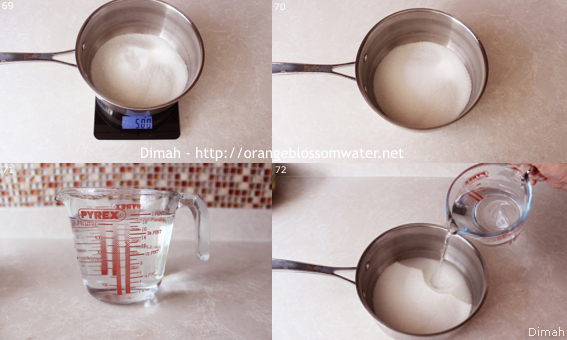 Add 125 ml water to sugar syrup. Bring sugar syrup to boil. Add eggplants to sugar syrup. Add 2 cinnamon sticks and 4 clove buds to sugar syrup. Add 1/8 teaspoon lemon salt (citric acid). Turn off heat. Keep eggplants in sugar syrup and allow to cool to room temperature. 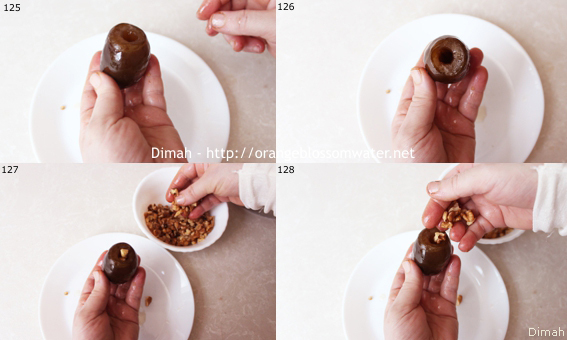 Measure 50 g chopped walnuts in a bowl. Add 1/8 teaspoo ground cinnamon to chopped walnuts and mix. Stuff each eggplant with walnuts mixture. Do not discard the sugar syrup. 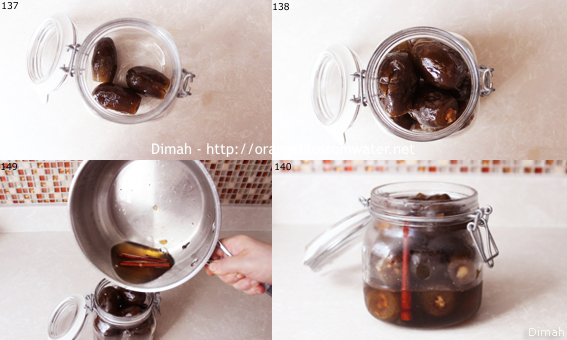 Transfer stuffed eggplant jam into a jar. Pour syrup with the 2 cinnamon sticks and the 4 clove buds over eggplant jam. It is fine if syrup did not cover all the eggplants. Seal and store in the refrigerator. Bring eggplant jam to room temperature before serving. Serve in paper liners if you like, or just in a plate without papers. 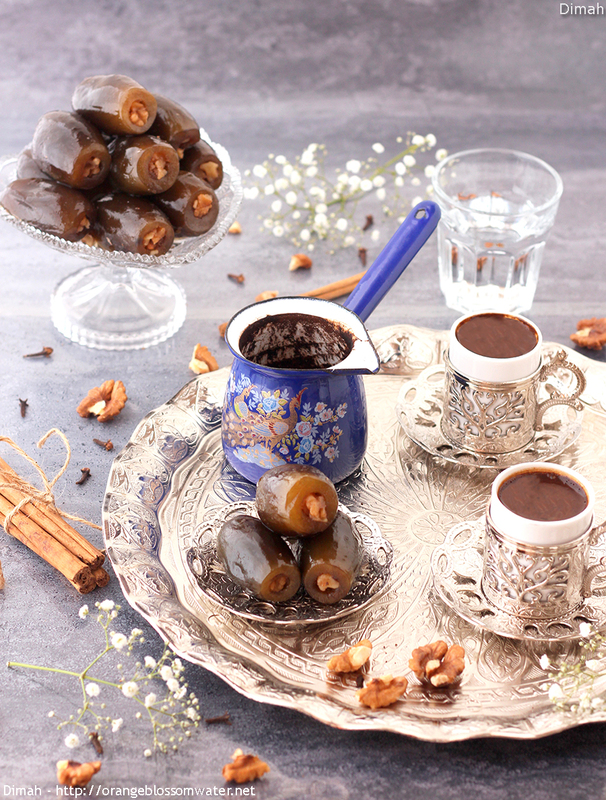 Serve Mrabba Al-Bathenjan Al-Halabi with Turkish coffee. Slaked lime should be use, it cannot be substituted and cannot be omitted from the recipe. Slaked lime is used to keep eggplants firm and prevent them from turning mushy and soft when cooked in sugar syrup. Slaked lime can scald and burn your skin, you have to be careful. 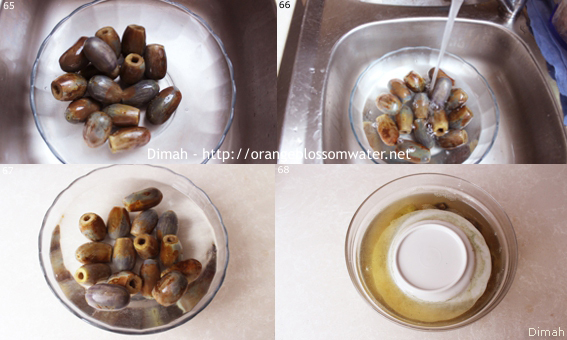 Do not throw slaked lime (white precipitate) in the sink, it will block drain pipes. 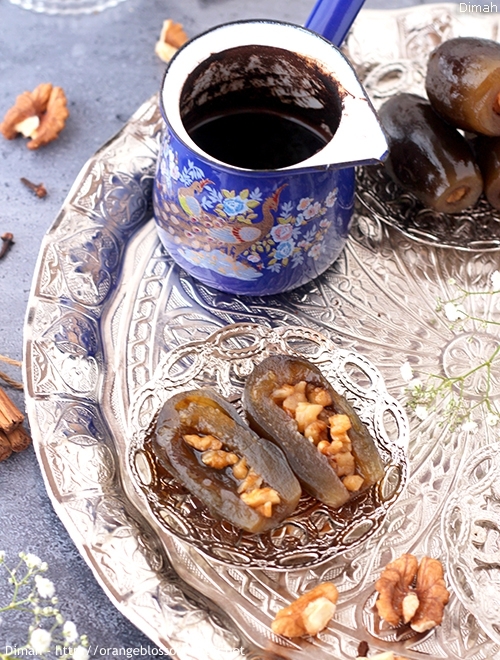 In Syria, this variety of baby eggplants used for the recipe is called “Bathenjan Homsi or Bathenjan Tadfi”, it is grown in Homs, Hama, Aleppo, and Idlib. 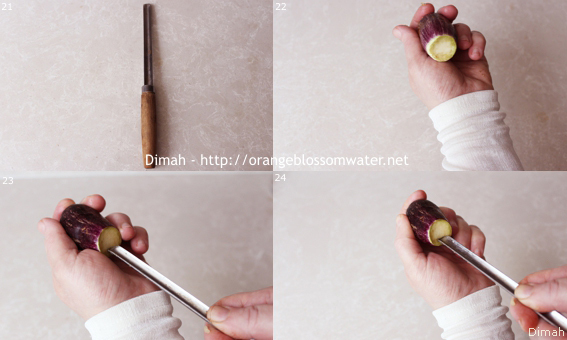 Squash / Eggplant Corer is a utensil used to hollow the vegetables, it is called “Syrian Munara”. 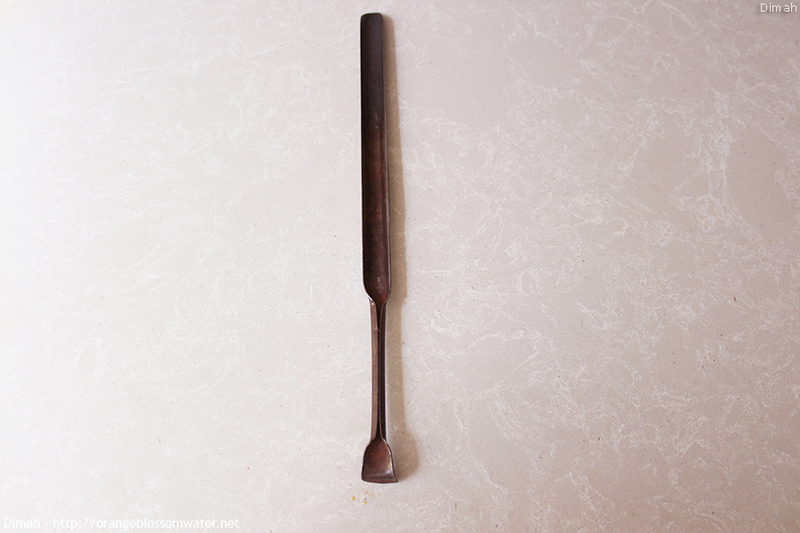 Click here to see the one I used, and click here to see different squash /Eggplant corers. 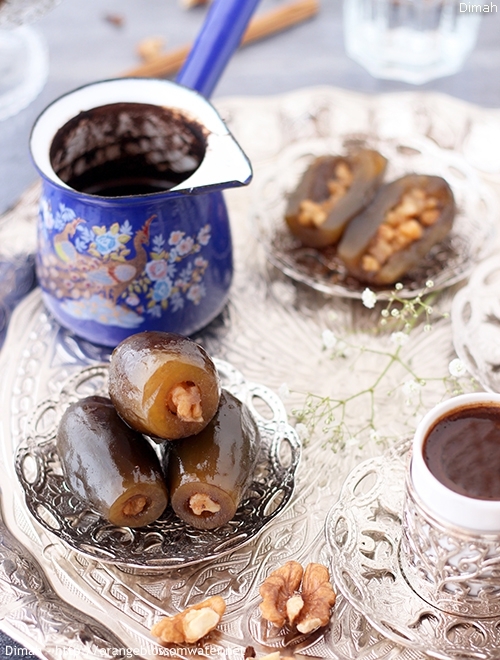 Some people store eggplant jam without stuffing with walnuts mixture. They stuff it at time of serving. This entry was posted on Wednesday, November 30th, 2016 at 9:14 PM	and is filed under Syrian Baking and Desserts, To Aleppo With Love. You can follow any responses to this entry through the RSS 2.0 feed. You can skip to the end and leave a response. Pinging is currently not allowed. Its very healthy and Delicious and I enjoy having it. Using vegetable for jam is a very innovative and good idea.